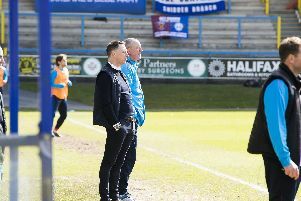 FC Halifax Town are just one place outside the play-offs after seeing off strugglers Nuneaton 2-0. Goals from James Bolton and Lois Maynard helped Town to their third win in four games in front of 1,227 fans at the Shay. Football - FC Halifax Town v Nuneaton.